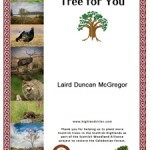 Our dedicated tree-planting gift is one of the most eco-friendly and unique presents you can buy! It's a gift that doesn't 'cost the earth' and it's suitable for all occasions, a very special way of giving something back to the planet. It is truly the gift of a lifetime! We only plant native species to help restore the Caledonian Forest and just ten trees offset the typical family's carbon footprint for an entire year! 100% of the profit from this goes directly into tree planting. We have a small number of benches that we plan to site on paths around the nature reserve, offering somewhere to rest and relax for visitors. A few people will be able to sponsor one. In return we will affix a brass plaque with the wording of your choice and once this has been done, we will send you a photograph of YOUR bench. These solid 5ft benches are manufactured from pressure treated redwood by the Scottish Prison Service. The timber is sourced from well managed and sustainable forests. This work helps prepare prisoners for life on the outside and helps to ensure that the prisoners who undertake this work are less likely to re-offend. 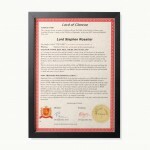 We bestow the Lochaber Arms* on all our Lairds who purchase one of our larger plots, and this beautiful parchment certifies your right to display these Arms and use the style and title of Laird (Lord) or Lady of Lochaber. Full colour, archival parchment and an embossed seal complete this Award. 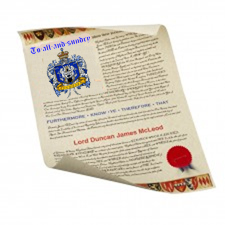 Each Award of Arms confirms the rights of one Landowner to use the Arms of Lochaber in perpetuity as a Laird, Lord or Lady of Lochaber. Please provide one full name and title as you wish it to appear on the Award and your plot number ( if not buying this with a plot of land today). 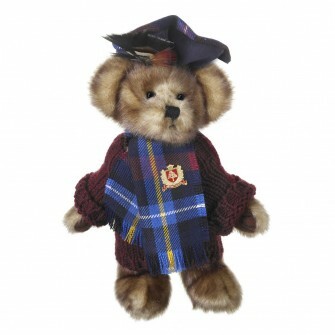 The Official Highland Titles Tartan. 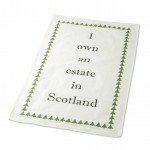 (to order more than one metre, please amend the quantity). 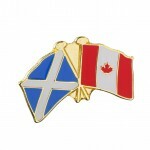 Registered with the Scottish Register of Tartans. Composition: 100% Pure New Wool. Made in Scotland by Lochcarron. Detailed large wall plaque, which features the exclusively designed buckler for Highland Titles. The shield is made from solid hard wood (dark walnut finish) and is personalised with YOUR name and title engraved on a brass plaque. Up to 24 characters can be engraved, although we advise that you restrict the number of letters to 22 or less. The rear of the plaque has a keyhole notch for hanging flush to your wall. 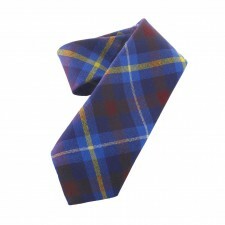 This Highland Titles tartan tie is made in a lightweight 8oz wool tartan fabric woven in Scotland..
Dimensions: 147cm long by 9cm at the widest part (58 inches long by 3.5 inches at the widest part) Free delivery. We ship world-wide. Surround yourself with the wonderful texture of soft natural fibre. 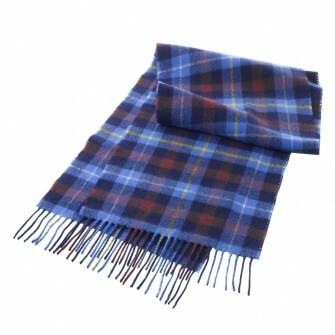 This lambswool scarf is rich, lightweight and a versatile choice for year round comfort. Measuring a generous 30 x 140cm the scarf is 100% lambswool and finished with a rope fringe. 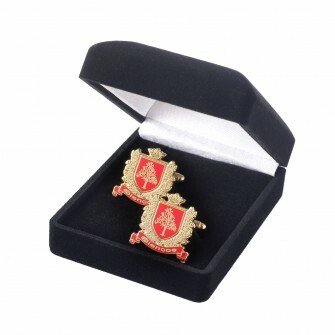 Pair of Glencoe Crest cufflinks boxed. Elegantly understated, these Glencoe crest cufflinks are are presented in a smart presentation case making them an ideal gift. They make a colourful finishing touch to any formal outfit. Each pair comes in a presentation box. * Total runtime 25 minutes approx. A set of four coasters depicting beautiful images on and around Highland Titles' Glencoe Wood estate. Perfect on your coffee table or as an addition to your dining set. Our beautiful letter opener is a classic gift that will always be appreciated, both practical and elegant. 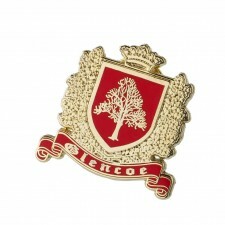 Our magnificent lapel pin allows you to proudly display your Crest. 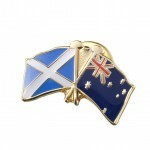 A stylish accompaniment to any item in your wardrobe. 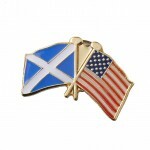 Measures 1" in diameter, oval flat-enamelled pin badge. Free delivery. We ship world-wide in secure mailer. Please check your order summary (below) before proceeding to the next stage.